In southern Mauritania, it is about one PM when Nejiha returns from the Monguél village market. Her eldest daughter is busy preparing lunch under the khaïma, while her brothers play cards a few meters away, without being distracted by the smell of frying food in the courtyard. At age 55, Nejiha is the head of a family of nine children and four grandchildren since her ex-husband left her. She is one of the beneficiaries of the "Productive Transfers / CASH +" project implemented by FAO in the wilaya of Gogol. The project, funded by Finland, aims to strengthen the resilience of vulnerable populations in Mauritania and Mali. The CASH+ approach flexibly combines unconditional cash transfers with transfers of inkind productive assets, accompanied by technical training, to benefit vulnerable and food insecure households. In the Gorgol region, two different transfers of a similar total value have been distributed, and their respective impact in the short and medium term are compared. The first kit, of which Nejiha benefited, includes three cash transfers for a total value of 96,000 MRO (USD 270), while the other kit combines a single cash transfer of 20,000 MRO (USD 56) and the provision of three goats. 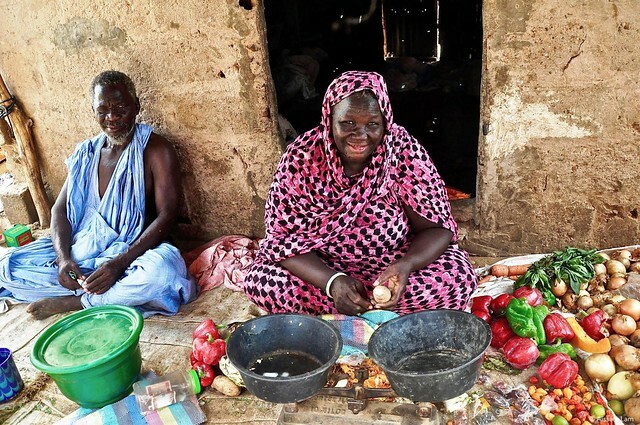 Nejiha supports most of the expenses of the family, as her new husband Abdou, a meat cutter, only gets irregular income. As soon as the opportunity arises, Nejiha invests in income-generating activities, which she has done here. "With the first cash transfer, I immediately invested in a small business. I stock up my display at the market which allows me to earn between 6,000 and 7,000 MRO per month, thank God” Nejiha says. "To know in advance when I was going to get the cash allowed me to organize with my creditors, and to use the profits of my business wisely.” The second transfer enabled her to repay her creditors and to cover the family's food and health expenses, while the last one was mostly used to increase the capital of her business, repay family debts and pay school fees. Despite the cumbersome tasks to be accomplished every day, Nejiha does her best to keep her children going to school. In the Gorgol region, where productive transfers are implemented, three-quarters of the women are heads of households. More than half of them are illiterate, operate on low incomes and are dependent on external aid, making them more vulnerable to food insecurity. Cash transfers help ensure a better access to food and to income generating activities, that can in turn help vulnerable households better cope with shocks. A significant number of FAO’s beneficiaries take this opportunity to invest in projects that are useful not only in the short term, but in a sustainable way. According to Nejiha, this support came at the right time and undeniably served as a stepping stone, and is giving her confidence in the future.